I think my favorite charcoal grilled snack or appetizer would have to be chicken wings. I enjoy them fried, but I really love them cooked over the coals for two reasons. First is the grilled flavor – charcoal grilled chicken is probably my favorite meat behind a perfectly cooked ribeye steak. Second is the endless amount of sauces or spice rubs that can be applied to take their flavor to a different level. I rarely make my wings the traditional way, or buffalo style, and douse them in a hot sauce and butter mixture. I like to get creative with the sauce. 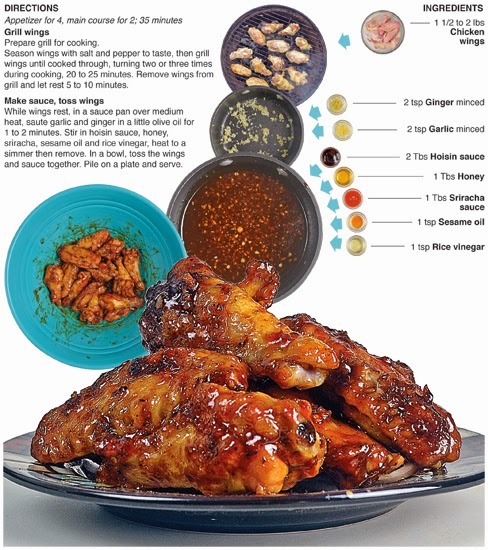 For this recipe, the wing coating features the fruity and sweet hoisin sauce, spice from sriracha and the aromatic ginger and garlic that all together provides an Asian-style flavor. Like most chicken wing recipes, they’re messy! I ate them by myself for lunch, and I’m glad I was alone because the site of it would have given small children nightmares for years to come. I practically needed a fire hose to clean up the delicious mess. It seems that boneless wings are becoming more and more popular at restaurants. They’re easy to devour with no worries of a bone getting in the way and they're just as tasty as traditional bone-in wings with the same type of white meat. 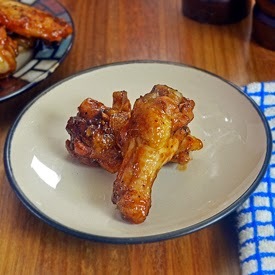 For some reason though, I still lean toward the traditional bone-in style wings. There is something much more interactive about having to pick all the meat from the bones rather than just tossing them back like popcorn. The effort to eat them seems to create a more enjoyable culinary experience for me. I could be crazy, well, in fact, I know I’m crazy – but that is just how I like my wings. Also, when cooking them it’s easy to tell when the wings are finished because the meat will recede a little from the bone making for a nice visual cue announcing the wings are ready to scarf down. Now, I’m not gonna kick someone out of the kitchen for making boneless wings, I just have a slight preference for the traditional variety. 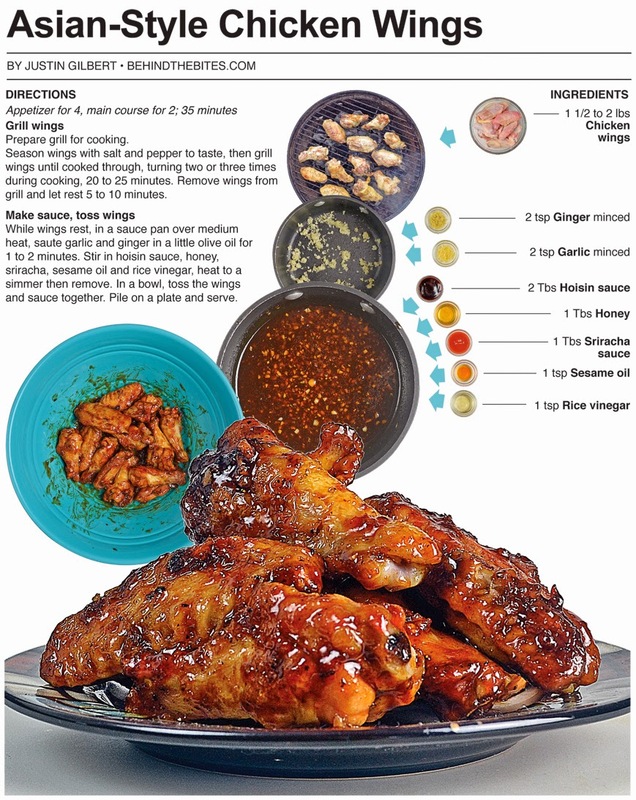 Season wings with salt and pepper to taste, then grill wings until cooked through, turning two or three times during cooking, 20 to 25 minutes. 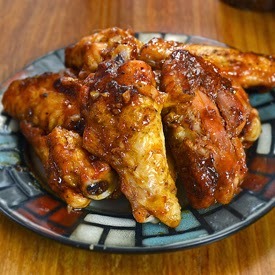 Remove wings from grill and let rest 5 to 10 minutes. While wings rest, in a sauce pan over medium heat, saute garlic and ginger in a little olive oil for 1 to 2 minutes. Stir in hoisin sauce, honey, sriracha, sesame oil and rice vinegar, heat to a simmer then remove. In a bowl, toss the wings and sauce together. Pile on a plate and serve. 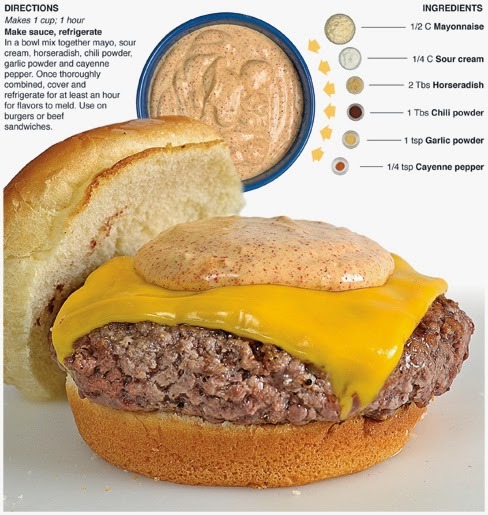 One way to put a twist on a burger and turn it from good to great is by creating a custom sauce for it. The Big Mac from McDonald’s is one of the most famous burgers in the world and part of its success is the “special sauce” that adorns it. The majority of the time when I make a sandwich, I grab a salad dressing rather than ketchup or mustard to top it just to ad another layer of flavor. I’ll use ranch dressing on any cold meat sandwich because, to me, ranch is the bacon of the sauce world – it makes everything it’s used on taste better. 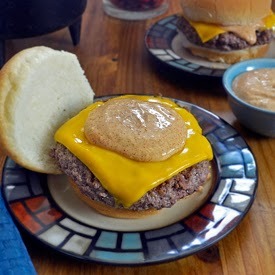 For this recipe, I make a custom sauce for burgers or any sandwich made with beef. It features horseradish which provides a spicy, aromatic quality that compliments the bold flavor of the meat. Garlic powder, chili powder and cayenne pepper add zest and spice to the sauce while mayonnaise and sour cream form the base and provide the creaminess. 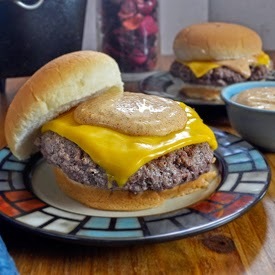 All together, this sauce will take any burger or roast beef sandwich to the next level of yum. Now that summer is here and the majority of my cooking involves a grill or fire, I’m noticing a pattern. The real creative part of what I have been putting out involves compliments or additions to grilled meat – like this sauce. I make lots of spice rubs, sauces, marinades and side dishes when I’m grilling and for the last couple months that has been the focus of the food I have documented. I love working the grill, but that is just a small part of making a great plate of food over the fire – a perfectly seasoned and cooked steak doesn’t need anything else to be amazing, which is why the compliments are so important. They must stand up to the meat and this sauce does just that. It was good enough to win the praises of my niece despite the fact that it's spicy. Usually she doesn’t like anything with even a hint of heat, but she liked this enough to eat an entire burger slathered with it. If you like horsey sauce from Arby’s this is a must try. In a bowl mix together mayo, sour cream, horseradish, chili powder, garlic powder and cayenne pepper. Once thoroughly combined, cover and refrigerate for at least an hour for flavors to meld. 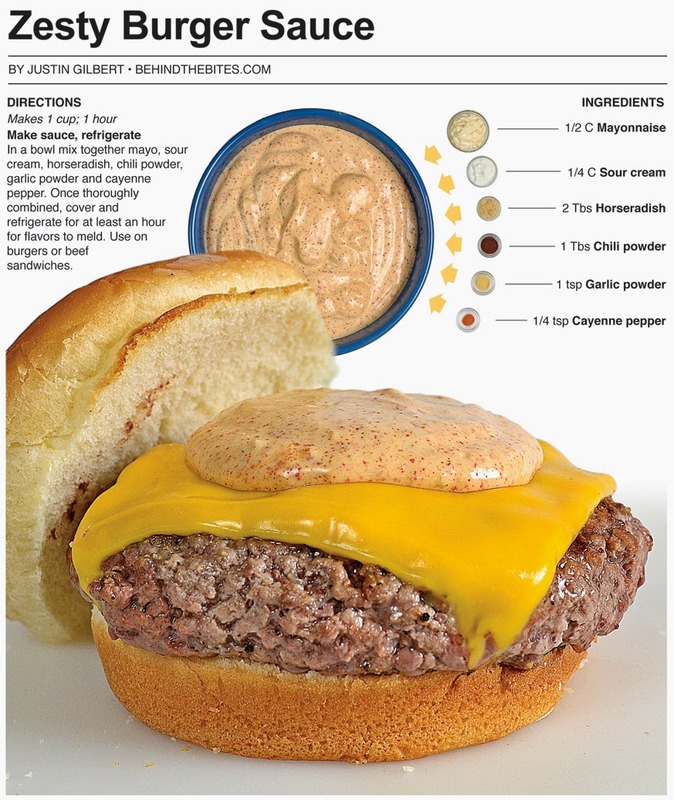 Use on burgers or beef sandwiches. For the last couple of years I have donated my time and food to the Relay For Life cancer walk in Whitley County, Indiana. My cousin Tammy is a cancer survivor and is a big contributor and driving force behind the fundraiser. Last year, I made 25 lbs of pulled pork for the Relay's survivor dinner. It always feels great to contribute to such a good cause. This year, when Tammy ask me if I wanted to pitch in, she told me they were making a taco bar. I knew instantly what I wanted to contribute – authentic Mexican style taco sauce! 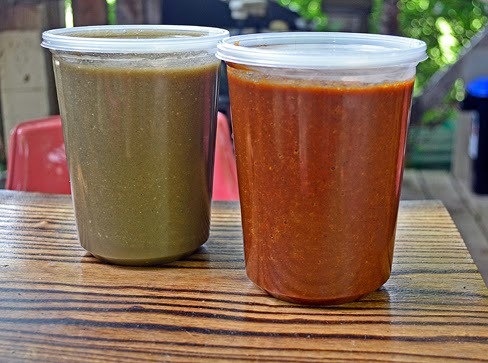 I decided to make a salsa verde as well as a salsa roja and I wanted to charcoal grill the vegetables to add further depth to what I think is mandatory for a great taco - GREAT TACO SAUCE! 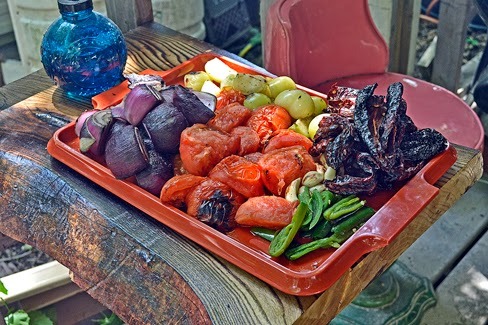 The night before, I bought the fresh vegetables and took them to the family campground where I crashed for the night. In the morning I woke up, brewed some coffee and fired up the charcoal. I grilled the vegetables and blended everything down in two batches making a quart of each type of salsa - plus a little extra for my own tacos later that night. I decided to go mild with these batches. I love hot salsa, but I have found the majority of people at large dinner events prefer mild to no spice. It almost disappoints me that so many people are afraid of the heat, but I accept it and make the adjustment when cooking for crowds. I was really happy with how this salsa turned out, the smoky grill added an extra element of flavor to the salsas and the final product had a smooth and silky consistency. One thing I have been doing the last few times I have made taco sauce is letting it liquify in the blender for a good amount of time. I pulse it at first, then turn it to high and let it go for 5 or 6 minutes, I also add a little water to thin it out, which really makes it nice and easy to spoon onto the tacos! Toss vegetables in a little olive oil, season with salt and pepper to taste. Grill until wilted and cooked soft. 8 to 10 minutes, rotating and moving around as needed. Put grilled vegetables in blender along with all other ingredients and blend until liquified, 5 to 6 minutes. Adjust seasoning if needed. Hot dogs are a year-round guilty pleasure for myself, especially with chili! It’s the summer time though – when dogs seem to be synonymous with campfires and grills – that I eat them most. They’re one of the easiest meals that can be produced on a fire and only require hands to devour, making them ideal for backyard parties and 20 minutes snacks before heading off to the ball park. 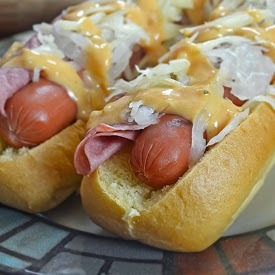 Hot dogs can also be taken to another level of flavor with a few simple toppings. A can of chili, some nacho cheese or a slice of bacon and dressing from the fridge are all that is needed to put a flavor twist on this American classic. 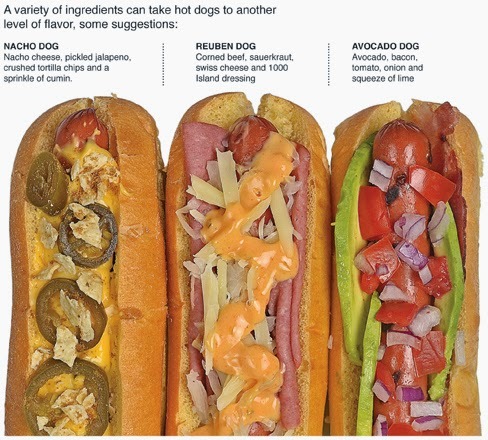 There are limitless combinations of garnishes that can be used, which make hot dogs an ideal center piece to a bar of toppings for a summer party. 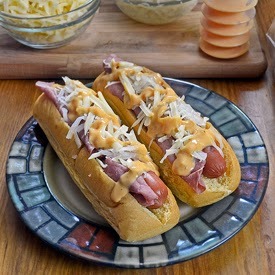 This post contains a few suggestions for toppings that will create three distinct and delicious hot dogs, but adding more or mixing the toppings creates endless snack possibilities for around the campfire. This is the first time I have created my weekly print column and used only one photograph to illustrate the recipe, in fact there are 3 recipes in one photo! 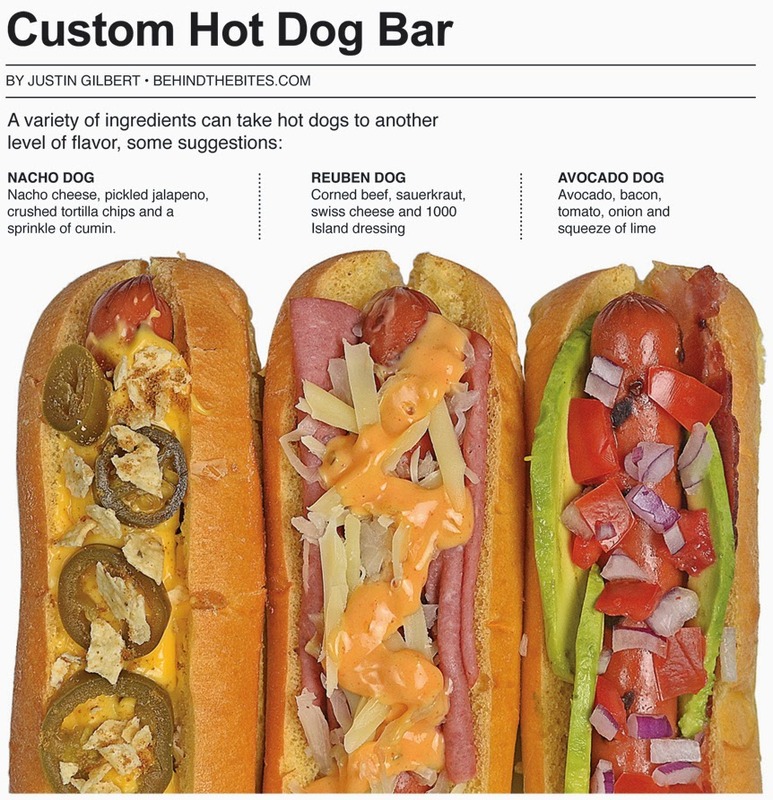 I just thought the best way to illustrate a column about a hot dog bar was to photograph three custom dogs with all of the ingredients visible. It only took one shot! This is a big moment in the four-year history of my food column! I’m not going to start doing one-photo recipes all the time, but if it makes sense to illustrate my concept in general, I will gladly try the one photo approach. In fact, I have already done it again with another column that I haven’t published yet but will in the next couple of weeks. I really like how this turned out, there is something very magazine about one bold picture. I love the detailed multiple-photo approach that most of my columns feature, but I have to admit there is something very yummy about one big ol’ pic of delicious food! Nacho cheese, pickled jalapeno, crushed tortilla chips and a sprinkle of cumin. There are many in the culinary world who believe the onion ring was invented by a Dallas, Texas-based restaurant chain named the Pig Stand in the 1920s. But there are numerous recipes for batter dipped and fried vegetables, including onions, in American cookbooks published before the 20th century ever began, according to the The Oxford Companion to American Food and Drink. The Pig Stand is most likely the first retail outlet to serve the crispy fried treats but almost certainly not the true origin of the recipe. 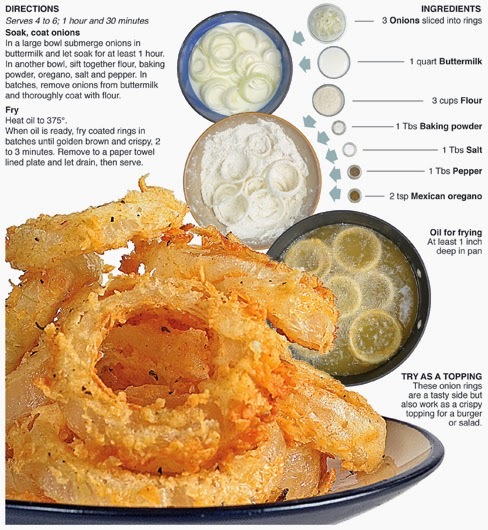 Most onion rings have a thick crispy breading resulting from being dipped in a batter and fried. For this recipe, I went a different route. I treat the onions much like chicken, first soaking them in buttermilk, then dredging them through seasoned flour right before putting them in hot oil for a warm bath to cook them through. 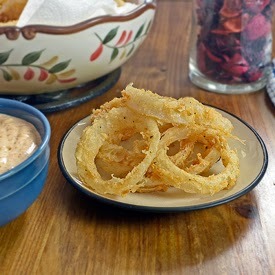 The end result is a light, crispy coating surrounding the star of the show – a sweet and delicious ring of onion. 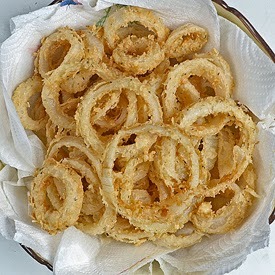 Onion rings change from cook to cook and restaurant to restaurant, but most are served with a thick and heavy breading that will often dominate the flavor of the entire bite. Beer breading is a famous preparation for onion rings and often I find the flavor of beer too strong. I’m a purist when it comes to beer, I like the flavor of it all alone, as it’s being poured directly on my taste buds. Beer is added to batter because the carbonation gives it a lighter, airier texture and the beer is often a prominent flavor in the final bite. I actually like using seltzer water when making batters, because it provides the same light batter as beer, minus the beer flavor. 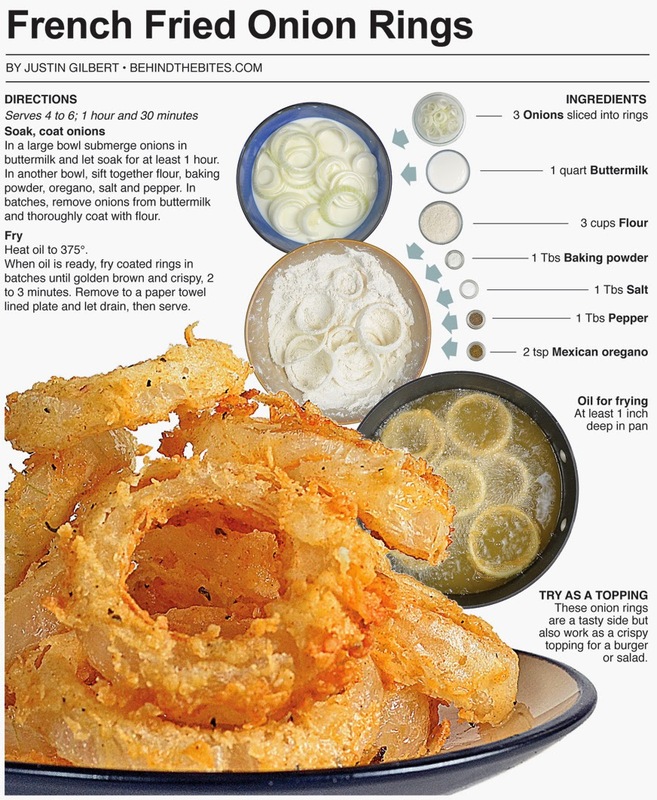 The onion rings in this recipe just completely avoids the whole batter thing in general. I have made onions this way before, the difference this time is that I left the rings whole. In the past I have used onion strings, because they were only intended for a topping. Whole rings allow these to be a side to a steak or sandwich rather than just a topping. In a large bowl submerge onions in buttermilk and let soak for at least 1 hour. In another bowl, sift together flour, baking powder, oregano, salt and pepper. In batches, remove onions from buttermilk and thoroughly coat with flour. When oil is ready, fry coated rings in batches until golden brown and crispy, 2 to 3 minutes. Remove to a paper towel lined plate and let drain, then serve.